Continually strive for service excellence through our people, our well designed processes and our professionalism in delivering solutions. PEOPLE are our most important assets and key to our success. Continuous upgrading and refreshing their skills and competencies is part of our total commitment to further add valued and create new dimensions to our services to customers. PROCESS consistency is a hallmark of quality. Subjecting our process to regular view for continual improvement is our quality objective. 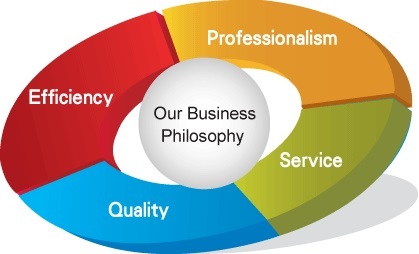 PROFESSIONALISM is our service principle to secure lasting win-win partnerships with our customers. Delivery of value for money knowledge-based solutions is our commitment. We are creating key resources centres with a view to generate synergies from the various expertises so as to arrive at creative solutions for all our partners.